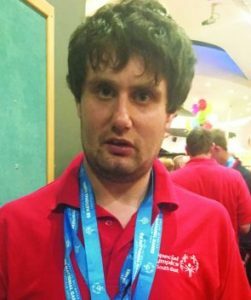 A WOKING man is celebrating after striking treble gold at the Special Olympics in Sheffield. Mikey Lines, 29, of Mayford, picked up the coveted honours in ten pin bowling (singles, doubles and team disciplines). The 29-yearold, who has autism, is a member of LinkAble, a Woking-based charity providing sports, social and recreational activities for children and adults with a broad range of learning difficulties. “It was a truly outstanding performance’’, said LinkAble’s Kathryn Richards. Mikey’s parents, Sally and Alistair, have been encouraging their son since he took up the sport when he was a child. After taking part in three National Games, achieving top scores in all competitions, Sally and Alistair discovered ten pin bowling was part of the Special Olympics programme and Mikey’s continued progress was to be world-class. Now Mikey has added confidence and he takes part in the ten pin bowling league in Guildford where he has to conform to league rules. The Special Olympics was the country’s largest multi-sports event for athletes with intellectual disabilities to be held this year. Around 2,600 athletes with intellectual disabilities of all ages and abilities came together from across the country. They were supported over four days of competition by 800 coaches, 1,000 volunteers, 200 officials and over 7,000 family and friends.